A very popular local dining venue with a regular loyal clientele. 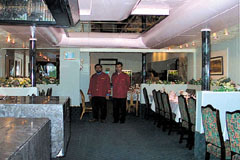 The Rayners Tandoori, established for over 15 years, has built an enviable reputation for its consistent quality of food and excellent service. Based on over 30 years experience of operating fine restaurants, this family run establishment provides a relaxed atmosphere in which to enjoy the wide variety of dishes on the menu, including many Rayners Specialities. Every Sunday there is a buffet lunch – “eat as much as you like” for £6.95 (chhildren under 10 £3.95). Open every day noon-2.30pm and 6-midnight. All major credit cards accepted. No service charge.